Description: The 1125 & 1026 idle 3 tracks apart from each other. Description: 223 stops at Andover. Description: 465 to South Acton arrives at Concord. Description: 231 flies through Melrose led by GP40MC 1125. Description: A backwards trainset at Worcester. Description: NS power at the Juniata Shops along with a Massachusetts Bay Transportation Authority GP40MC. Description: NS 2220 on the shop turntable. Description: NS 2220 picks up the NS 9446 to take it out of the shop. Description: NS 2220 is almost off thr turntable. 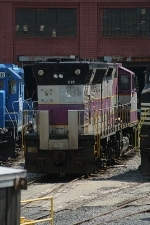 Description: Light power from Q-264 passing a westbound MBTA Commuter Train. Description: Inbound commuter running wrong hand main in Ayer, MA. Description: Trainsets from last night are plugged in at Boston Engine Terminal.